There we were, me and my new fishing apprentice at the lake. I was teaching him the rudiments of handling the rod and putting the bait and we were trying to catch a lake trout while discussing everything from sports to the most effective technique to escape from boring clothes-shopping with our wives. I got some good ideas, I must confess. At some point he asked me if there were some other fishing techniques or alternative styles. “Is it always just a fishing rod, reel, bait, and waiting in sport fishing?” he asked. Of course it is the most common way to fish but it is not the only way to fish. 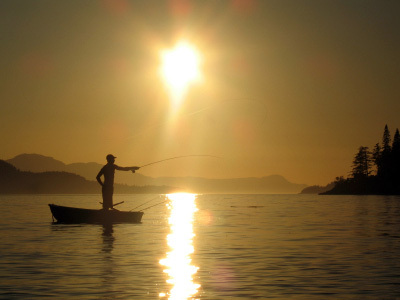 In sport fishing, there are different techniques and tools for fishing depending on the type of fish you want to catch. There are even games you can play with friends or family. One of Murphy’s laws says that if something can be used for something else besides its original use, someone will do it. Some techniques or methods are more dangerous or fun than others. Before I could explain him about some fun ways to fish as well as others too dangerous to practice for a starter, I don’t know why it came to my mind a piece from the New Testament that says that Jesus is reported to have said to his disciples: “Follow me, and I will make you fishers of men.” (Matthew 4:19). Then I said that in those times, fishing with a net in a group was considered an honest effort to make a living. I don’t know if he is a religious man, but he agreed with that idea. Some of you might not like the techniques discussed here. Others will love them; it is a mater of diversity and sportsmanship. when you are diving or “Pearl” Fishing. A variant of it is the Hand-Line Fishing. You just need a line and a small piece of wood or something to roll the line. I’ve seen this done at some beaches in Mexico but, as far as I know, this is illegal in Kansas. which might not be fun if you keep losing arrows!! common until recently and are still used in certain areas. The casting net is circular and the diameter varies. The way to use it is sinking it at the same time you make a forward motion from surface-down to bottom and then up. There is a chance that you catch something else, but hey, some coracles are as good as fish, besides this is also the way they are caught. trapped, the fish can neither advance trough the net nor retreat. world. It was used by people who did not have a boat to fish, but also was very handy when fishing conditions were difficult or the fishing places were inaccessible or dangerous. hole in the ice, just don’t put your hand in it! some natural toxins found in some plants, and the main idea is to paralyze the fish so you can easily catch it by hand. The fish either dies right after suffocating or later in transport. This is not only dangerous because you can get poisoned too, but it is illegal. kills by direct hit or shockwave. The worst thing about it is that it is not selective. also injure a diver and he can get really mad at you. The device is supposed to be secure for water usage since it has a dead-man-switch in case you fall in the water. So my Padawan learner might want to get into other fishing techniques. And I hope he does as long as he doesn’t blow up a lake or electrocute someone else, after all, fishing is a gentlemen’s sport based on honest effort.